Notes: A fundraising event for the school in Solihull. All in a U version for family viewing and with the races named and as well as the snails for extra fun as they are introduced by Peedy parrot. Update: The event was well attended as per usual at this annual event with a turnout of 240 people. So much money was raised that it couldnot be counted before #reporting back to us so it was a lot. Everyone thought the whole thing was excellent. Needing Fundraising Ideas, Party Ideas, Event Ideas . . . ? 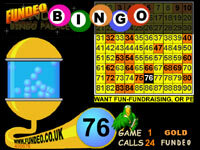 Fundeo Race Night and Bingo Packs are perfect fundraising ideas and great entertainment too. . . . . see how to raise over £1000 in just two hours! "This was our first fundeo snail race night. It was a roaring success and we raised £1420." "As usual an excellent night. People are so busy enjoying themselves they don't realise that they are raising funds for charity." "We had a great night drinking, betting, laughing, auctioning and winning prizes. We raised a lot of money for our school too!" "Personalisation of the fundeo snail racing is unique. A hoot of an evening. No comparison to an old-fashioned race night." "We had never attempted anything like this before and were thrilled . . . people were still talking about it as they left. " "Another fantastic night, enjoyed by adults and children alike. Delighted to have raised this much money for charity." "Brilliant service . . a fundeo snail race is a must for a great fun night and to raise extra funds for your cause." Website © Fundeo 2000-2019. Fundeo Snail Racing © Fundeo. Fundeo is a registered trademark ®.